I did it. I finally broke the four hour barrier and smashed my pr to smithereens. I am so happy. I trained hard this summer for this race. I lost lots of weight. I stressed in the last month about my injuries that I thought would take me out of the race. But all the stars aligned just right for an awesome Twin Cities Marathon! The weekend was amazing from the start. We arrived at the Holiday Inn around 10:00 in evening on Friday and unwound in the room with a glass of wine. On Saturday morning I lounged in bed while Lisa went down to the capitol to watch our friends Rebecca and her son finish the 10K. Afterwards we met up in the hotel restaurant for a late breakfast. The restaurant service left a lot to be desired. It was more than an hour before we were served. I don’t know why they don’t plan for having cooks there on the weekend. Anyway, we finally ate. I had some oatmeal and a poached egg. After breakfast Lisa, Spencer and I headed across the street to the Xcel center to pick up my race packet. The TCM has a pretty darn good expo and we did spend an hour or so passing by all the booths. We didn’t want to stay too long because Saturday was the day we planned to go to the Mall of America. Lisa and Spencer picked up some free ride tickets for the amusement park there during the 10k race and Spencer was anxious to get going. After relaxing for a little be we headed on over to MOA. Spencer lucked out and one of his ticket coupons was good for 100 tickets which set him up for free rides the entire day. While Spencer and Lisa were having fun in the amusement park I had to spend some time doing some reading for work so I parked myself on a comfy chair across from the Apple Store. We also had a genius bar appointment to look at Spencer’s ipod touch. Turns out it was broken and they replaced it on the spot. We met up with our friends and looked for some dinner. We ended up at Bubba Gumps in the MOA. Since we waited so long for a table they actually ordered appetizers for us for free and they were delivered to the table as soon as we sat down. The service was night and day compared to breakfast at the hotel. I tried to eat light and had salmon with some pasta and vegetables. I did drink a bit of wine. Ok, a bottle of wine. But that is not unusual for me. We got back to the hotel around 9:00 and I went straight to bed. Sunday morning at 4:45 am my ipod alarm went off. I slept really well – better than I had in a while. I felt rested and ready for the race. My back felt great and my foot had no pain at all. I had a banana and a south beach protein bar for breakfast and started to wake my body up. I checked the weather – 36 degrees with sunshine and a high in the low 60’s expected. What a perfect day for a race! At about 5:45 I laced up my shoes and headed on over to the Crown Plaza to catch the bus to Minneapolis. I arrived at the Metrodome at about 6:15. Plenty of time to hit the bathrooms about 6 times before the race. I don’t know what it is but my bladder tends to be overactive before every race. Since I usually end up having to use the facilities in the beginning after a race starts I tried to line up at the portapotties just prior to the start. At 7:45 I was still looking ahead at a long line waiting. People were getting antsy and it was getting close to start time. People were cheering on the pee-ers. I finally made it into the john and out with just a few minutes to spare. I sprinted on over to the starting corral (number 2 for me). It was so crowded with thousands of people. As I was pushing my way forward I bumped into a friend from Washington, DC. Funny that I bumped into him in almost exactly the same spot at last year’s race. Completely unexpected. Anyway, I was way in the back and I wanted to start closer to the beginning of the corral so I jumped over the fence onto the sidewalk and made my way forward. I jumped back into the crowded chute near the 4:30 pacer thinking I was further ahead but the gun was going off and I had no more time to find my place. And then I was off. The start was great! I was feeling really strong and it was nice and cool out. My plan was to start out at about an 8:45 pace and see how I felt midway through the race. But with my hectic start I wanted to get up near the 4:00 pacer so I could gauge my run a little better. So I started out fast the first mile passing everyone I could. I edged my way forward and at about the 1 mile mark I saw the balloons for my target. I quickly caught up to the pacer and told him the rules – he was not allowed to pass me during the race. The adrenalin was pumping and the first mile was faster than I planned (7:50 pace). My Garmin was about 0.1 miles short of the 1 mile marker and about .25 miles short by the end of the race. Anyway, after that first mile I eased my pace down to a more comfortable one and continued ahead of the pacer. As it turns out I never saw him again. Running through Minneapolis was gorgeous. I was feeling really good int hose first few miles through the city. 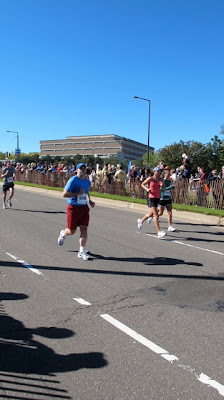 There was good crowd support and I was going at a good pace (mile 2 – 8:47, mile 3 – 9:03). Once south of the city and getting into the residential and lakes areas I started to focus more on keeping a consistent pace. I did REALLY well on this race with miles betweein 8:30-8:45 all the way up through mile 18. I was feeling good on the gentle hills and enjoyed Lake Calhoun and Lake Harriet. And the people racing were as awesome as the crowds cheering us on. Around mile 5 I talked to a gentleman who was running his 73rd marathon. 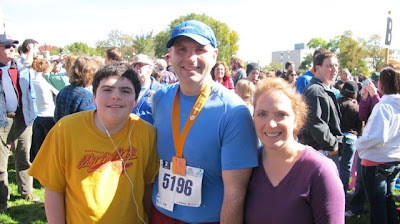 His 13 year old daughter is going to run with on when she turns 18 and he plans that to be his 100th race. How inspiring is that? And then there was the Cherry and Spoon lady. Yes, someone was running in a Cherry and Spoon costume. You know the famous cherry and spoon sculpture in Minneapolis. It turns out she wasn’t even from here. She works and is going to school in Fayetteville, Arkansas. I thought it was great she was celebrating Minneapolis art this way. I ran near her for most of the race until the last 6 miles or so when she pulled ahead of me. I have to say I felt pretty darn good during this race. I did start to feel some aches in my left hip around mile 12 but it was minor. I was going strong and did not slow down until mile 18 or so. As a matter of fact I never slowed down to a walk until somewhere in mile 18 – the longest I have ever run non-stop. When I did I thought my legs would fail. I didn’t realize what different muscles you use when walking and it was clear they were going to sleep on me. I was starting to feel the fatigue but I kept going. Mile 19 my pace slowed a little bit to 8:54 and after that I could no longer maintain a pace less than 9 minutes. I was starting to feel my quads pretty bad when I passed the wall at mile 20 (9:20 pace). At this time I knew I would probably make my 4 hour goal but I didn’t want to let up. But I was beginning to really tire and had to walk a bit through the water stops. I focussed on trying to maintain a 9:30 pace and used the inspiration from the Wall at 20 miles to speed up a little bit. Mile 21 – 9:17, Mile 22 – 9:35, Mile 23 – 9:45. I was trying to tell myself that it was only a few more miles but my energy was draining fast and my muscles were screaming at me – “What more do you want from us?” I pushed onward and pulled out a 9:31 pace for mile 24 and it was then that I really hit the wall. My right quad started cramping. I slowed to a walk for a brief moment to try to stretch it out and then I sped back up. I gritted my teeth and ran through the pain and managed to push through mile 25 at a 9:55 pace. I kept telling myself – don’t slip past a 10 minute mile! Keep going. You’re almost done!. I should say there are a lot of hills from mile 20 to 26 and I was proud of myself for keeping it going through the pain. I was starting to feel something in my left foot around mile 21 and that was getting worse too. I was afraid to look. The last mile was awesome. I dug down really deep and pushed all the pain out of my mind. I managed to push through mile 26 at a faster 9:27 pace and when I came up the hill and rounded the corner by the cathedral I knew I had this one in the bag. I looked downhill to the finish and started sprinting. As I was coming down to the finish chute I saw my wife and son there cheering me on. I looked up and saw the clock above the finish line – 3:59:53 . . .3:59:54 . . . 3:59:55 . . . I pushed harder and crossed the line just as it showed 4:00:00. What a finish! I did it. I made my goal. My official chip time was 3:55:35 – a new PR for me. I don’t think it gets better than this. Later in the hotel when I took my shoes off I found out why my foot was starting to hurt. 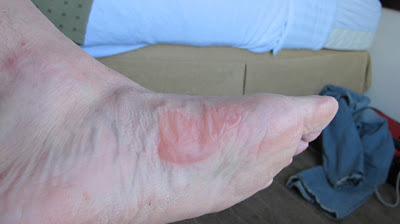 I had one big blister. Fortunately it was just a sack of fluid and it really wasn’t too torn up. As a matter of fact there was no pain after a couple hours. It was worth it!